Organized retail crime is a huge enterprise and hits locations everywhere. Dallas, TX, and the surrounding areas are no exception and the Loss Prevention Team at DSW decided to take action to address the problem. While DSW already employs sophisticated alarm and surveillance systems to combat nighttime burglaries, ORC boosters tend to work so quickly that they escape with the goods before police or security arrive at the store. One effective solution is to be able to follow the criminals and track them back to wherever they are storing the stolen goods...this gives the possibility of catching the boosters but also of busting an entire fencing operation and putting them out of business. Using 3SI Security System's Asset Tracking Program, DSW believed they could do just that. Using the covert devices when the store is closed, the trackers lie silently in wait until they detect a burglary. Burglars have no idea they are taking trackers along with the stolen merchandise...their goal is to get in and out of the store as quickly as possible so they don't take time to look for security devices. 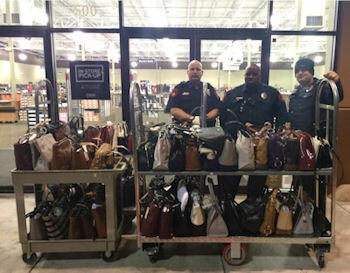 At 3:34 AM on January 13, 2016, approximately $6,300 of designer handbags were stolen from the DSW store in Lewisville, TX. The burglars didn't know that some of the bags contained trackers. Multiple local PDs were alerted immediately that the handbags had been stolen and could view the movement of the stolen bags using the 3SI Secure Tracking Website. After DSW Loss Prevention confirmed the break in with the alarm company, police began a high speed pursuit with the vehicle, which was a stolen Toyota Corolla. The DSW LP team was also actively monitoring the trackers in real time. After several minutes of active pursuit the suspects abandoned the car in a back alley and fled on foot. Police were able to find the vehicle and recover all of the stolen merchandise. No suspects were found in the area. Currently, the car is being impounded and the GPS units were recovered. Total recovered merchandise: 57 handbags for a total of $6,296.74. While no suspects have been apprehended yet (a police investigation is ongoing), DSW has successfully protected their brand and made their company a hardened target for criminals. Criminals talk...and word will get around to avoid hitting DSW stores and focus on easier prey. Thank you to Greg Dolcich, Regional LP Investigator, DSW, for this article submission!